After the death of his wife, prosperous businessman Chance Boden heads west along the Santa Fe Trail with his son to escape the powerful control of his in-laws. He has plans to establish his own ranch, but instead he finds work with Frank Chastain, owner of a vast amount of land. Chance doesn't want to work for anyone, but Frank's beautiful daughter, Veronica, gives him reason to delay buying his own holdings. With winter coming, no home in which to live, and Veronica's offer to care for young Cole while Chance learns the ways of ranching in the desert, Chance has little choice but to accept the Chastains' offer to stay on. When Frank is attacked, his last wish is that Chance marry his daughter, but after dealing with his in-laws, Chance doesn't want anyone coming between him and his son. Then, before Frank dies, his precarious hold on the land he received as part of an old Spanish Land Grant forces him to make a desperate choice to save Veronica's inheritance--and also gives the men who attacked Frank a reason to come after his legacy. 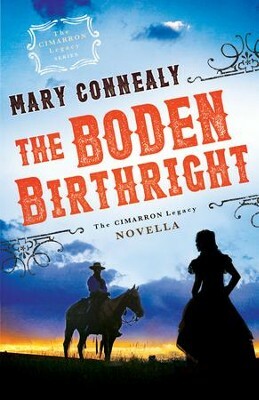 Mary Connealy pens "romantic comedy with cowboys" and is known for her fun, zany, action-packed style. She has been a finalist for the RITA Award, Christy Award, and Inspirational Reader's Choice Award and is a two-time winner of the Carol Award. Mary has over half a million books in print. She lives on a ranch in eastern Nebraska with her very own romantic cowboy hero. Learn more at Mary's website and blog: www.maryconnealy.com. I'm the author/artist and I want to review The Boden Birthright (The Cimarron Legacy): A Cimarron Legacy Novella - eBook.